Revelstoke's Mackenzie Avenue; a place where barmen remember your drink, name and where you come from. (Photo: Iain Reid). We discover the true heart of Canada in amongst some of its greatest snow spots. This morning a ‘granola type’ (as they call them around here) on the laidback streets of Nelson asked if I’d like a hug because he was giving them out for free. Now a lumberjack type (think Russell Crowe between movie roles) is spitting tobacco ‘juice’ from the corner of his mouth and telling me I’m putting the wrong fuel in my vehicle – except he calls it a ‘vee-hick-al’, like he’s watched far too much Deliverance. I’m guessing he’s not likely to give me any hugs, free or otherwise, and it’s not the first time on this road trip I’ve felt a hell of a long way from the sanctuary of Banff. Yep, the Powder Highway might be home to one of the highest concentrations of ski resorts on the planet, but you wouldn’t know it here. The Powder Highway wraps itself around 1000km of the prettiest alpine landscape in North America (Photo: Tourism BC). It’s called a highway, but it’s actually a collection of five roads that run 1000 kilometres in a circular direction in the very south-eastern corner of British Columbia, and along these roads are ski resorts almost nobody’s ever heard of… hmmm, Red Mountain, anyone? And there’s some that almost nobody’s ever been to – when was the last time Whitewater Mountain came up in your Canadian ski conversation? All up, there are actually eight alpine resorts here, 11 Nordic ski centres, 15 cat-skiing operators and nine heli-ski operators in some of the prettiest alpine landscape on this Earth. However there’s far more to the Powder Highway than high-country thrills and spills. No, being here feels like a genuine cultural experience, for I’m not surrounded by Australians here as I am at Whistler. Here, locals wear flannelette even when it’s 30-below, and there are towns on this road that sound like Dr Seuss had some thing to do with naming them – though try rhyming with Spillimacheen and Skookumchuck. I’m avoiding some of the better-known resorts on the road, like Fernie Alpine Resort (see our Ultimate Guide to Fernie), simply because I’d like to disappear into a Canada that’s completely different to Australia, and where no Australians tread. So I start my journey as far south as the highway goes, at Red Mountain – in fact, it’s just six kilometres north of the US border. It’s the oldest ski resort in western Canada. There’s only six chairlifts here, and they sure move slowly. If you’re in a rush, you should avoid this place because nothing, and nobody, moves fast around here. Locals are a mix of lumberjack types and ski bums who never really grew up and got real jobs. I love the old hippies with their flowing beards that look a little like Willie Nelson – though when I try to follow them down ski runs I discover 50 years of riding these mountains has turned them into backcountry hellraisers who’d ski rings around wannabes 40 years their junior. Happy hours at the Flying Steamshovel are legendary, though for those chasing a tad more culture than four-buck beers, aim your vee-hick-al north another 50 kilometres and visit Canada’s most famous counter-cultural town. Ski gear lining the platzl at Kimberley (Photo: Mark Eleven Photography for Ski RCR). You’ll find Nelson right beside Whitewater Ski Resort. 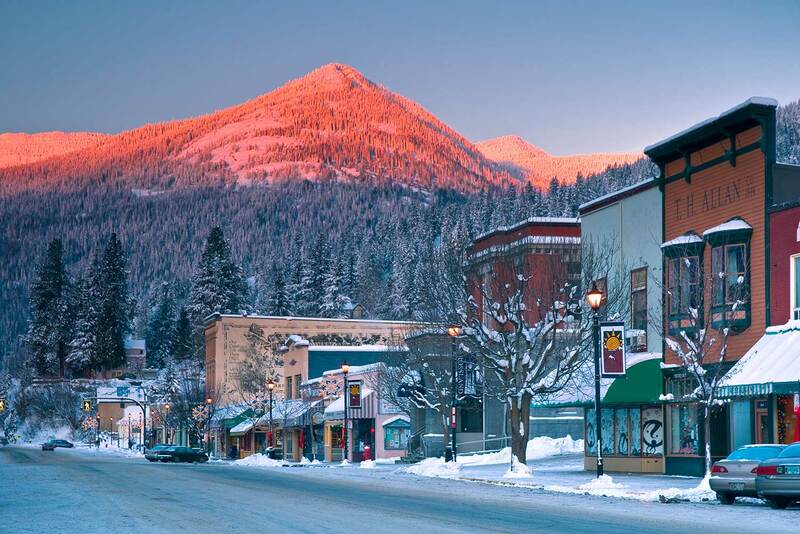 Nelson has to be one of North America’s prettiest towns – built as it is right on the edge of Kootenay Lake and in the shade of the towering Selkirk Mountains. It may look sleepy, but the place buzzes with life – it has the most famous small-town arts community in Canada. Everyone around here is an artist, it seems, except perhaps the guy on Baker Street trying to sell me an ounce of “Canada’s best weed” (or maybe he’s the biggest artist of all). Nelson is one of those rare towns you feel you could live in within minutes of walking its main street. It has over 350 heritage buildings and a fully restored street car, though mostly it’s the people who make it – while Canadians are famous for their friendliness, Nelson takes the friendly scale to dizzy new heights. Locals round here favour hemp over flannelette, Birkenstocks over logger’s boots; though just east of here I find a street where people wear Bavarian-style lederhosen. Few Australians head into Kimberley (see our Ultimate Guide to Kimberley), but it’s as stunning a town as you’ll see in western Canada, with its views out over the Purcell Mountains. It was once the site of the world’s biggest lead-zinc mine, but when it closed Kimberley faced economic ruin. To promote tourism, Kimberley re-invented itself as the ‘Bavarian City Of The Rockies’, building a downtown platzl (city square), Canada’s largest free-standing cuckoo clock and introducing the world’s biggest annual accordion championships. Yessiree, you’ll see a little of everything on the Powder Highway. Further north, I find a local out walking his pet pig in the historic streets of Revelstoke (see our Ultimate Guide to Revelstoke): the kind of town where barmen remember your drink, your name and where you come from. Once not much more than a stop on Canada’s Union Pacific railway link, these days Revelstoke is the epicentre of the world heli-skiing industry. 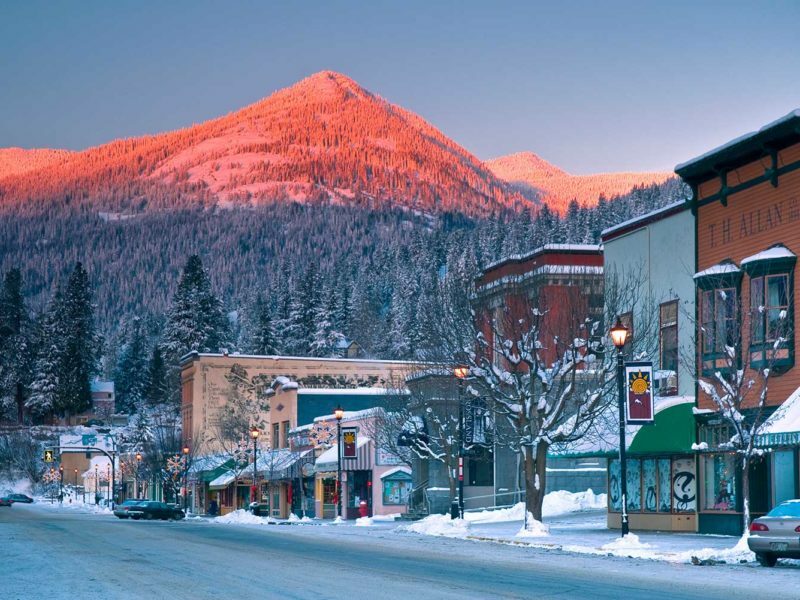 But somehow town never forgot its humble working-class origins, even though many of the visitors here are forking out $2000-plus-a-night to stay in five-star heli-ski hotels. Red Mountain is just 6kms from the US and the oldest ski resort in Western Canada (Photo: Ryan Flett). And in this way I think Revelstoke epitomises the Powder Highway. Somehow, in an area of the Rockies so spoilt for ski mountains and stunning alpine scenery, nothing got spoilt at all. Towns still feel decades from being over-run. The road is yours to ride alone, and it’ll take you into the breathing soul of Canada – if you’ll just let it. The Powder Highway stretches from Revelstoke in the west to Fernie in the east, and Red Mountain in the south to Kicking Horse (see our Ultimate Guide to Kicking Horse) in the north. There are three gateway airports to start your Powder Highway adventure: Kelowna in British Columbia, Calgary in Alberta and Spokane in Washington. If you fly to Spokane, your journey will begin at Red Mountain; if you fly to Calgary you’ll start in Kicking Horse; and if you fly to Kelowna, you’ll begin in Revelstoke. Hire cars are available at all three airports. For more information on the Powder Highway, check out hellobc.com, and the town of Nelson.